Affiliate marketing is a legitimate industry. There are no two ways about that. Don't let anyone tell you the whole industry is a scam! However, there definitely are some affiliate marketing scams that we've seen people fall prey to. This often happens to newbies and leaves them with a bad taste in their mouths. We don't want you to become disillusioned with affiliate marketing, so keep reading and stay safe. Like any other online industry, there are plenty of scams doing the rounds in the world of affiliate marketing. Scammers (unfortunately) are always trying to find new ways to make money off innocent affiliates. These are some of the most common affiliate marketing scams we've come across. Most newbie affiliates like to do a training course to get started in the industry. There will be hundreds of people trying to sell you a course, an e-book, a webinar and various other kinds of information. Do your research before you pick your training program. Many of these training programs are often nothing more than a rip-off. You don't actually learn anything useful and you're out whatever money you spent, as well. At the most, you might get an e-book that is full of fluff and no real, actionable lessons. So make sure do your training with a well known name. Check out AffiloBlueprint - a step-by-step system for newbies that shows you how to build an income from your website. The reason affiliate marketing gets such a bad rap is because of the proliferation of get-rich-quick offers everywhere. They promise you will make thousands of dollars overnight, or that you can just work 2 hours a day and have $5,000 in your bank account at the end of the week. If anyone tries to sell you a "secret system that works," don't believe them. Legitimate affiliate marketing takes a bit of time to learn and while you will make money from it, it doesn't happen overnight. You need a strategy and you need to implement it well before you make any income. Affiliate marketers make their money by promoting someone else's product or services. If a company is promising you thousands of dollars in income, look closer. What is it that you're actually selling? If there is no actual product or service, it's nothing more than a scam. Real, legitimate affiliate programs are free to join. An authentic affiliate program should be risk-free for affiliates. You should never have to pay a fee to sign up to a program. If you are asked to pay a fee to join, steer clear. It is most likely an illegal multi-level marketing scheme. Be sure to check out our forum post on how to tell the legitimacy of an affiliate program. If you fall for the blatant lie, they will tell you as the original owner of the particular business name, they will give you preference. So you have the right to register the abc.cn domain name with them, first. You will be sent a price list and they will make money off you by making you purchase a domain name that you didn't ever need. There are a few other variations of this type of scam, so beware of any random emails concerning your domain names. The rule of thumb before signing up for any affiliate program or affiliate training course is to do your due diligence. There are some well known and reputable programs and courses in the industry (including ours!) but when you're new, it's hard to tell. Follow these tips to make sure you don't get caught up in an affiliate marketing scam. If Google isn't yielding much information, head straight to the company website. Legitimate companies in the affiliate marketing industry always have professional websites. If this is not the case, it should raise a red flag for you. The bottom line is, if something is too good to be true, you are better off being suspicious about it. Be wary of unrealistic offers, easy money schemes and any businesses (especially foreign) offering to help you with something out of the blue. Use your common sense and you have nothing to worry about. There are hundreds of genuine and completely legitimate ways to make money as an affiliate. Be aware of the affiliate marketing scams, but don't let them keep you up at night! 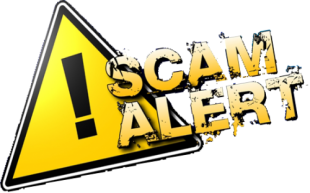 Do you know of any other affiliate marketing scams that we've missed? Let us know and we'll add them to the list.